In the fifteen years since they first appeared, Kreidler have, alongside To Rococo Rot and Tarwater, redefined Krautrock for the twenty first century, working influences ranging from early Kraftwerk, Neu!, Faust or Can into more contemporary structures. Founded by To Rococo member Stefan Schneider, with Thomas Klein, Andreas Reihse and Detlef Weinrich, Kreidler released a first album, Riva, in 1994, followed by a string of EPs and singles leading to Weekend, an album released two years later. Schneider left the band following the 1998 Appearance And The Park album to focus on other projects, but the rest of the band carried on ploughing the same furrow with their next records, mixing live instrumentation, electronics and occasional vocals. After the rather subdued moods of their last two records, Eve Future (2002) and Eve Future Recall (2004), Mosaik 2014, Kreidler’s first album in five years, and their debut on Antonelli’s Italic, marks a return to more ambitious compositions and more openly electronic forms, woven into live drums and treated guitars. The title appears to hint at a future devised some decades earlier, evoking sixties and seventies visions of what the twenty first century would look like. Indeed, there are constant hints at the music that has inspired the band over the years on here, but these influences are once again worked into the music in such a way that, although they feel undeniably part of the fabric of the record, they never appear invasive. Instead, they bind the compositions together and help create a strong impression of consistency throughout. Through its flow and underlying narrative, Mosaik 2014 often sounds like the soundtrack of a long lost sci-fi movie, with a clear progression and a strong focus giving its many parts total coherence. The three opening pieces, Mosaik, Zero and Balearic, are linked by clear connecting dots, revolving around strong sonic spaces yet all three relying on particularly smooth melodic lines, and while the former, peppered with complex percussions, is a subtle and delicate piece, the latter two, more defined and driven by colder, more mechanical grooves, set this album on a more angular orbit. While later pieces, such as High Wichita, Impressions D’Afrique or Luminous Procuress appear at times more fluid and vaporous, this album is predominantly defined by clear strong lines. Brass Cannon and European Grey especially provide some of the most memorable moments on here, the former through its shimmering electronics and melodic theme, the latter through wonderfully airy soundscapes. 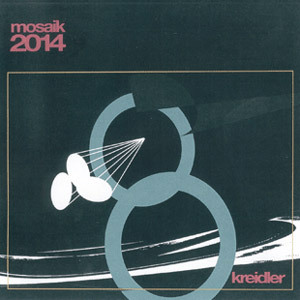 With Mosaik 2014, Kreidler move away from the delicate forms of their last two records to once again incorporate vibrant electronic textures. Kreidler have continuously evolved and redefined their sonic space. With this latest effort, they have created their most potent and robust record to date. Weekend, an album released two years later. Schneider left the band following the 1998 Appearance And The Park album to focus on other projects, but the rest of the band carried on ploughing the same furrow with their next records, mixing live instrumentation, electronics and occasional vocals.